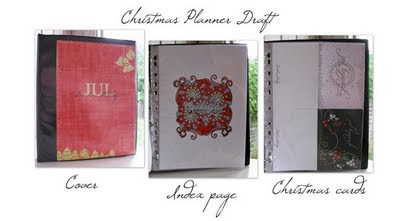 Webfrau from DSP has run a challenge this week as part of the Christmas in July celebrations to make a Christmas Planner and since I’m always behind around Christmas especially in the Christmas card department I jumped onboard hoping that I’ll be a bit more prepared this year. Well as it turned out I’m already behind and didn’t get to finish my planner before the week was over. Oh well – I guess December is still what 3 months away? So there’s still time to finish it.